Traveling all the way to the Holy Land and experiencing scripture come alive was a great confirmation of what I believe as a Christian. Being able to actually visit the locations of some of the greatest successes and laments of biblical history reinforced my faith of 57 years in Jesus. My wife, Cindy, and I embarked on our journey April 26 with a group of 31 other people from mostly Cincinnati. Our experienced host, Keith Thomas, from the Vineyard Church in Cincinnati, has led groups to Israel 6-7 times. After the lengthy flight, we arrived in Israel to meet our local tour guide who narrated all the sites, explained the geography and infused the historical perspective. 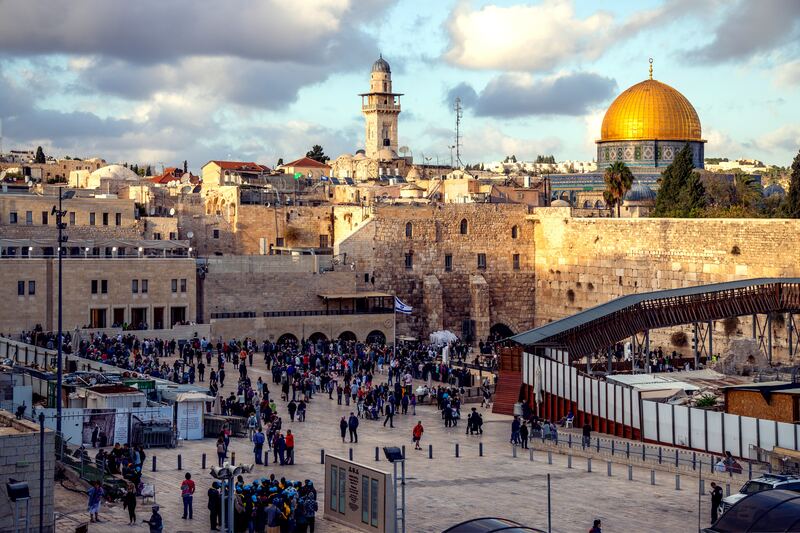 Israel is diverse in various religions (Jewish, Messianic Jews, Arab Christian, Muslims), which is why it is important to have a local guide who is educated in the differences. Keith did a great job with more in-depth spiritual aspects by reading scripture and providing time for us to pray. There were so many highlights of the trip. Seeing ruins that were over 2,000 years old and experiencing the history of Israel was something that I will remember forever. We took a boat ride on the Sea of Galilee where Jesus asked Peter “do you love me?” three times, saw where Jesus taught the Sermon on the Mount, visited Mt. Carmel where Elijah defeated the 400 Prophets of Baal, and also visited Caesarea Philippi where Peter proclaimed that Jesus is Christ. In addition, we were baptized in the Jordan River and were able to float in the Dead Sea. Being in the Garden of Gethsemane and also seeing olive trees over 1,000 years old growing on the Mount of Olives, were some of my favorite parts. There are many arguments about where the tomb of Jesus actually is, but it has been said to be at the Place of The Skull, which is a big rock that looks like a skull. Our tour guide would give us a scale between 1 and 4 of how accurate they believed the locations were, but just being in the vicinity of where Jesus walked, lived and died was so powerful to me. When we visited Shiloh where the Ark of the Covenant laid before it was taken, we were able to worship there in song and spend some quiet time in prayer. This was an incredibly holy place where the last tabernacle stood. Only the High Priest was allowed to go into the Holy of Holies where the Ark of the Covenant was. While we were there, I was overcome by the presence of God. I could feel the holiness of God all around me. There are times in our lives that God allows us to feel His presence more than others, and that was a defining moment for me. Since the Jewish people have not accepted Jesus as the Messiah, they gather at the Wailing Wall to read the Old Testament and pray for the Messiah to come. Men and women have separate areas where they were allowed to be on the Wall. People from all over the world have prayed there. I was able to pray for my family and friends. My feeling around the Wailing Wall was probably quite different than many others – I was deeply saddened for the Jewish people and prayed that they would come to accept Christ as Lord. My advice to you if you are considering visiting the Holy Land is to be flexible and be open to whatever God wants you to experience. Don’t try to be in control, and allow God to lead! But most importantly, go. Go and walk where Jesus walked to experience His presence in a whole new way. Wow! I would love to go and experience this! I can only imagine a how reaffirming this must have been for you two. Thank you for sharing this wonderful experience. I felt your passion as I read your story. My wife and I would love to visit these historic sites one day. May the Grace of God be with you and your family.. always. Thank you so much for sharing your remarkable experience. I am going to visit the Holy Land in March with Bridge Of Hope Church in Cincinnati. I am so excited, I just cant wait . As I was reading your story I could feel your passion and sense the presence of the Lord. It literally took my breath.